"I have absolutely never been this happy about my guitar tone. The GSP1101 possesses all of the great Clean and Overdrive amp tones that I have always wanted for the stage and in the studio." In 1998, Drover joined King Diamond, and appeared on the House of God album. 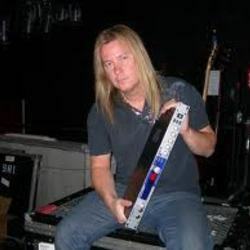 On Oct 22 2008, Testament announced that they have recruited guitarist Glen Drover to fill in on their upcoming Mexican tour dates with Judas Priest, Due to Alex Skolnick’s prior commitment to the Trans-Siberian Orchestra.7 Also in March 2010, during the time of him trying to finally finish his album, Glen also played with Testament on the “Rust In Peace” tour with Megadeth and Exodus in march 2010, due to Alex Skolnick being away again during this time. Joined the legendary seattle rock band Queensryche in july of 2012.